The Brave Series (or Yuusha Series) is a toy and animation franchise formed after toy company Takara decided to bring an end to animated "Generation 1" Transformers material in Japan, following a chilly reception to Transformers Victory and an overall decline in popularity, which also led to the cancellation of the OVA series Transformers Zone. Sensing that the coming 90s kids of the Japanese market wanted something different (and wanting to make sure that they remained market-relevant), Takara struck a cooperative deal with the animation studio Sunrise (which had just recently become one of the most famous studios in Japan due to the explosive success of the Gundam series) to develop a new franchise and set of toy lines, one that would also be separate from the (increasingly fraught and difficult) relationship Takara had developed with Hasbro. This would all lead to the development of the Brave Series, a landmark Super Robot series in the 1990s. Brave Exkaiser circa 1990, the first installment of the series. The King of Braves GaoGaiGar and GaoGaiGar FINAL - 1997-1998 and 1999 (respectively), the final installment of the series. A ninth series, The Saint Of Braves Baan Gaan, was planned but never produced. However, development was so near completion that Sunrise considers material from it to be canonical. 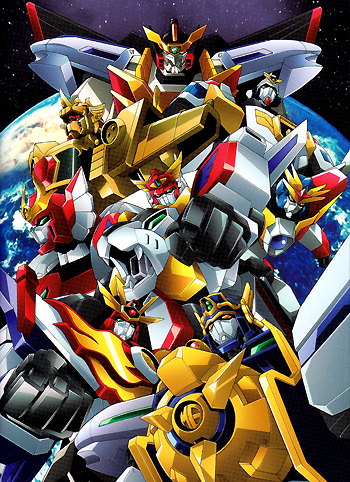 The material meant to be used in this canceled series was later recycled into the plots for the Brave Wars Video Game Quantum Leap Rayserver, and concepts from it later appeared in the unrelated Super Robot anime GEAR Fighter Dendoh (along with a few concepts from a planned GaoGaiGar sequel). Also, due to the OVA GaoGaiGar FINAL Grand Glorious Gathering and various plans for said sequel, Betterman'' can be considered a spinoff of the franchise. Koichi Chiba: Veteran voice actor who was promoted as Voice Director for the Brave Series starting from Da-Garn all the way through GaoGaiGar FINAL till his final breath. Known as the one who cast the heroes and kid heroes—notably Nobuyuki Hiyama. Chiba is also known to voice one-to-two walk-ons in each Brave title that he directs, most notably Cain of GaoGaiGar. Kunio Okawara: Chief Mechanical Designer of Sunrise, who, was already the Chief Designer for the Gundam franchise, came into the department to design all of the principal robots within the Brave Series franchise. He then eventually designed nearly every single robot for GaoGaiGar. Masami Obari: One of the most important animators involved throughout the series. Mainly on Title Sequences and Finishing Moves. Nobuyuki Hiyama: The only voice actor to be cast as Principal Actor more than once throughout the franchise, note Might Senpuuji of Might Gaine and Guy Shishioh of GaoGaiGar. earning him the reputation of The Hero; and ultimately became the person representing the franchise as a whole for the franchise's various anniversary events. Shinji Takamatsu: Director for 3 consecutive series of the franchise. note Might Gaine, J-Decker, and Goldran. Later known to be the director of, out of all works: Gintama, and Haven't You Heard? I'm Sakamoto. Show Hayami: The only voice actor to be cast as the Principal Robot more than once throughout the franchise. note Exkaiser and Da Garn. Captain Ersatz: Going back to their previous series, many shows tend to feature intelligent robots who could easily pay homage towards the Transformers franchise. In fact, several villain and ally robots are Reused Character Design from Transformers. All major protagonists and kid heroes would wear their non-combat, normal attire primarily in the combination of red and yellow (with green being the 3rd color in-line.) However, if they are paired up or have more than one Kid Hero/teammate, only one person will wear the staple colors; in this case, they don't need to be the main hero to wear them. This concept has been played with amongst members of The Brave Express Team. While Might Senpuuji managed to downplay this for himself,note He does don the color combo from time-to-time, but not prominent. people tend to forget his non-action teammate Hamada wore the yellow/red combo in place of him via a yellow shirt with tiny red brand logo. If you pull back to see the whole picture, Might (when in his red combat vest) and Hamada (with his yellow shirt) completed the red / yellow combo as a unit together. Cool Car: Naturally given the nature of this franchise. The police car in particular is usually assigned as the principal robot, because nothing can surpass the police car when it comes to proclaiming "justice and peace!" Panthera Awesome: Lions are a recurring motif, best visible in Exkaiser and GaoGaiGar. Ridiculously Human Robot: With some exceptions, most of the mecha are very human-like in nature. Even the ones that aren't usually can transform into a more human-like form. Super Robot Genre: Every single series. GaoGaiGar comes the closest to the Real Robot Genre due to everything being designed to work in real life so the toys would be accurate, but that's where the real-robot stuff ends and the courage-powered giant robots begins.